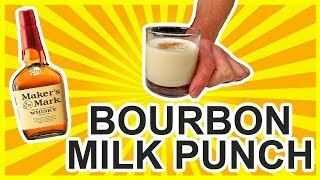 The Bourbon Milk Punch is a classic New Orleans favorite when it comes to brunch cocktails. Smooth and sweet with a bit of bourbon kick, this cocktail is sure to satisfy as the perfect end to a good meal. This particular recipe is very similar to the one used at the famous French 75 bar in New Orleans, LA. 1. Fill a mixing glass three-fourths full with ice. 2. 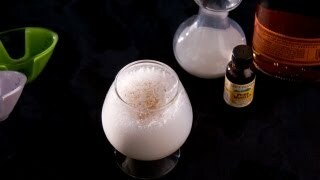 Pour in bourbon, rum (dark works best), milk, vanilla extract, and sugar syrup. 3. Shake well for 30 seconds until chilled. 5. Garnish with a pinch of ground nutmeg after letting drink settle in place. 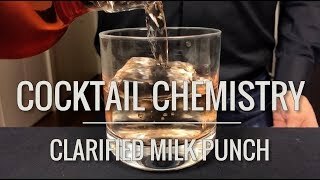 Bourbon Milk Punch - RICH & FREAKING TASTY! !